This case study examines the changing nature of water resources and availability in the Himalayas, specifically along the Kosi river, as well as the conflict between India and Nepal over water rights and failed attemps at cooperation in flood control measures, hydropower generation, and water catchment in dams. since 1954 when agreements were signed between the two nations, relations have stagnated, infrastructure has deteriorated, and millions of people have been threatened and displaced by floods that could have been controlled had the two nations worked together. I look at the 2008 Bihar, India flood in particular. I also touch on the politial will of China to divert water from the Tibet region to areas downstream that are rapidly developing in the 21st century. Conflict, which already exists over the contentious Tibet autonomy issue is likely to increase as it becomes a more valueable resource in terms of water. I will focus on the Kosi river (also spelled Koshi) and its source in several of its important tributaries, including the Tamur Koshi in the east, Arun Kosi from Mt. Everest in Tibet, and Sun Koshi farther west. The Chinese tributaries that flow into the Kosi river, which in turn flows into the Ganges river are all slated for future hydroelectric projects, and there are already many existing dams and hydroelectric generation plants in place. Another project on the Bhote Koshi River in Nepal could potentially threaten the flow of the Kosi, but also stands to provide a much more reliable power source to Kathmandu, the capital of Nepal, a few hours’ drive away. Likewise, in China, hydro projects on the tributaries of the Kosi pose threats of water shortages to downstream communities, but will provide stable power sources as well as means of flood control. China: Sits on vast water resources in its territory of Tibet, and has demonstrated a history of engaging in aggresive water control measures that threaten downstream interests with little or no warning, and very little international dialouge on water rights and resource management. There is a large internal political pressure to provide water for a gigantic population, and for the great South-North diversion project. Nepal: One of the world's poorest nations; Nepal suffers from chronic infrustructure decay, specifically water infrustructure. Nearly two-thirds of Nepalese people do not have access to clean drinking water. Nepal stands to gain a lot from hydro-power, and Nepal relies on international aid to implement projects. The Kosi barrage, with earth dams across the river, embankments above and below the river confine the river to flow within the perimeters of the embankments. Embankments on both sides downstream of the barrage with a length of 246 km (153 mi) was constructed to check the westward movement of the river. The embankments have been kept far apart, about 12 to 16 km (9.9 mi), to serve as a silt trap. The Kosi Barrage was built between 1959 and 1963 straddles the Indo-Nepal border. It is an irrigation, flood control and hydropower generation project on the Kosi River built under a bilateral agreement between Nepal and India: the entire cost of the project was borne by India. 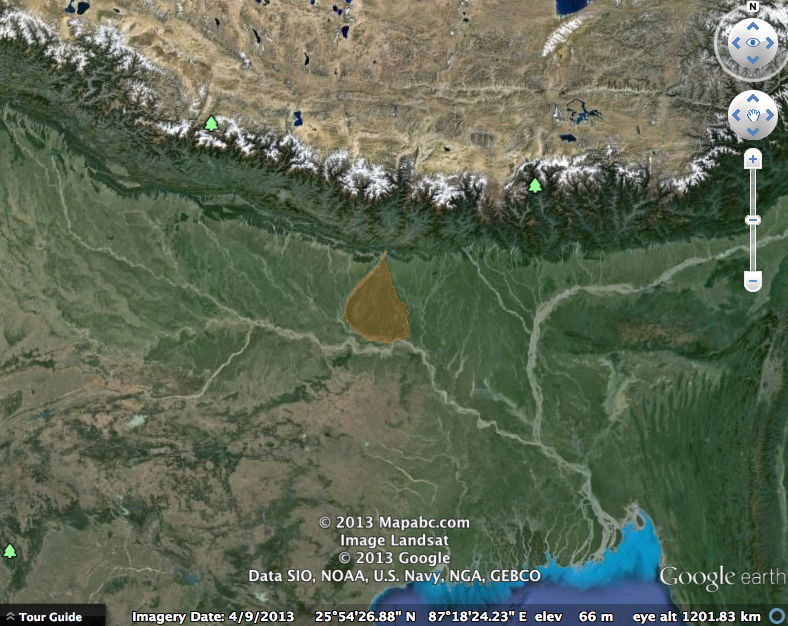 The catchment area of the river consists of 23,856 square miles in Nepal up to the site. The world’s highest peaks lie in its catchment area, and about 10% of the flow is snow-fed. The Eastern Canal and the Western Canal taking off from the barrage, were designed to irrigate a total of nearly 2.5 million acres of farmland. A hydropower plant has been built on the Eastern Canal, at a canal drop 2.2 mi from the Koshi Barrage to generate 20 MW of electricity. The Western Kosi Canal also provides irrigation (62,000 acres) in Nepal. With its tributaries, the Kosi drains the eastern third of Nepal and part of Tibet, including the country around Mount Everest. Some of its headwaters rise beyond the Nepalese border in Tibet. About 30 miles north of the Indian-Nepalese frontier, the Kosi is joined by several major tributaries and breaks southward through the Siwālik Hills at the narrow Chatra Gorge. The river then emerges on the great plain of northern India in the Bihār state on its way to the Ganges River. Because of its great outflushing of debris, the Kosi has no permanent channel in its course through the great plain of northern India. It has long been notorious for its devastating floods, which may rise as much as 30 feet in 24 hours and which long made vast tracts of northern Bihār unsafe for habitation or cultivation. Now a dam across the Chatra Gorge at Barakakshetra controls floods, permits irrigation of the floodplain, provides hydropower, and supports fish hatcheries. Corn (maize) is extensively cultivated on the sandy soils of the Kosi’s basin. Kosi Alluvial Superfan: an alluvial fan is a cone shaped deposit of sediment built up by a stream or river emerging out of a canyon or mountainout terrain and spreading out onto a flatter landscape. (wikipedia). The Kosi alluvial fan covers nearly 6,000 square miles. Flooding in Himalayan rivers is a natural, but very dangerous and unpredictable phenomenon. Rivers like the Kosi can very suddenly become heavily laden with massive amounts of water that must fit into narrow channels draining the tallest mountains in the world. 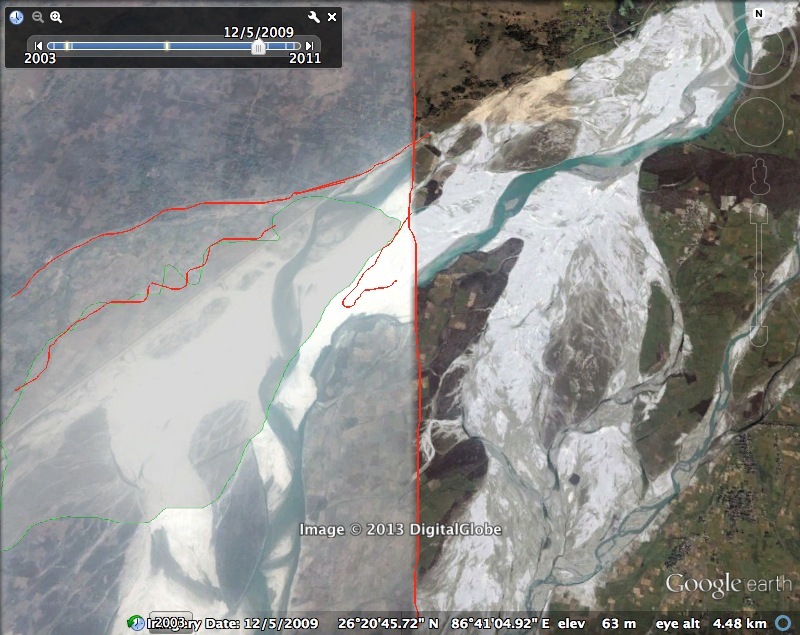 T he main channel of the Kosi has historically migrated dozens of miles over the last 200 years, as the river often expands into old channels when it floods within the Kosi river alluvial superfan (highlighted area in Orange below). This leads to massive flooding of rich farmland. To some extent the magnitude of this flood can be blamed on poor maintenance of man-made embankments built to control the river that failed in the massive flood. This highlights the potential dangers in relying on flood control projects that give a false sense of security and allow people to move into lands previously left unused as floodplains for drainage of monsoon rains. In a region with such high demand for food, it is hard justify leaving such a large area of fertile land like the Kosi alluvial fan unused despite the magnitude of flooding risks. In nepal, a dam neglected for decades by both Nepal and India and a failed partnership for a second dam likelyled to the catastrophic flood of 2008, which displaced over 3 million individuals. A warming climate also means that some lower elevations will lose their permanent snow cover and source of fresh water while other areas will experience higher melt, creating a greater danger for flooding in monsoon seasons, which will also increase in intensity. In the Tibet region, a drying trend is expected, highly dependent on the extent of drying in the neighboring Mediterranean region. The high and uneven terrain makes broad forecasts difficult in this region, however, strong drying trends in spring, summer, and fall are partly masked in the overall scenario by increasing winter precipitation. (IPCC report) tmore intense monsoon rains, more unpredictable dry seasons, leading to both water shortages and floods. Glacier-melt: In interior regions, those that rely on glacier-fed rivers will have less reliable access to water. In the year 2050, glaciers in the region will still have a presence, but because of warmer and drier summers, they will have retreated significantly, reducing late-summer runoff. Therefore, the source of flowing rivers in the region during the summer wet-season will be more dependent on the inconsistent, intense monsoon rains. Sattelite view from the year before and the year after the 2008 flood. The red lines are positioned identically in both pictures, highlighting the initial physical features and water ways. The thin green line marks the border of former farmland on the left and how it changed after the flood. 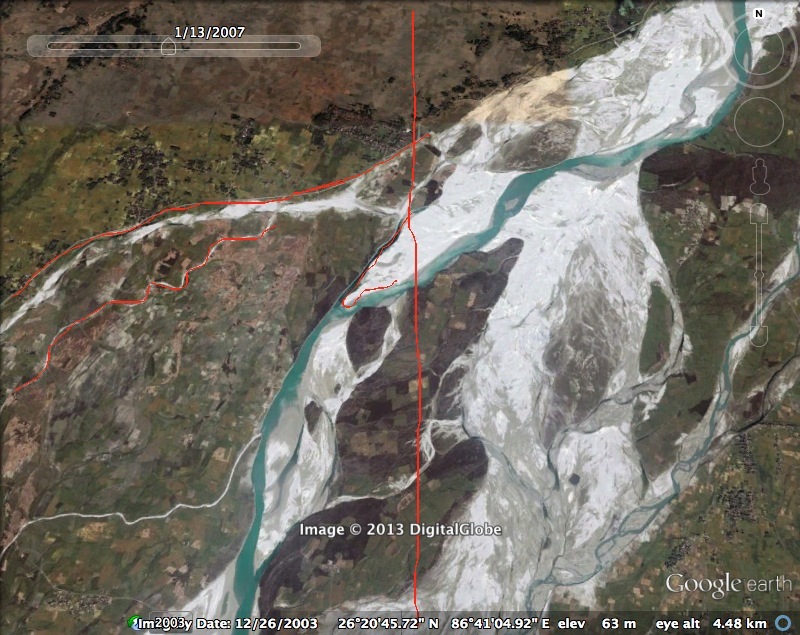 The red line bisecting the images marks the border of the extent of the 2009 satellite update. Subtropical Highland, Warm temperate, Humid subtropical, Cool semi-arid. The amount and timing of annual rainfall is highly dependent on the East Asian monsoon. Most rain falls in the summer months throughout the entire region. Bihar plains, where severe flooding is an ever present threat due to lack of effective flood control measures. Existing inadequate flood controls have proven to enhance the danger, as a false sense of security often develops, as in the case of the 2008 flood, in which flood protection embankments designed to control floodwaters failed, causing the inundation of farmland in the natural floodplain. Nepal: Hydropower potential being exploited and future projects being proposed threaten the water rights of India, specifically threatening the constant flow of water into Bihar during the dry season. There are domestic civil conflicts within China, especially in regards to the North-South diversion project, as well as in Nepal over the benefits of flood control and power generation versus the potential environmental damage. International: Throughout much of history in the region, China has been a dominating hegemon, which ensured relative peace, though control over the Tibet region has been contentious. Today control of this region is particularly significant because of its abundant water resources. The Himalayas and parts of the Tibetan plateau that extend from Nepal across the border into China are widely considered to be the “water tower of Asia.” They ultimately provide fresh water for over a third of the world’s population, including the countries of India, China, Nepal, and several other Southeast Asian nations that draw from the Mekong river system, which originates within the Tibetan plateau. This includes the countries of Laos, Thailand, Cambodia, and Vietnam. 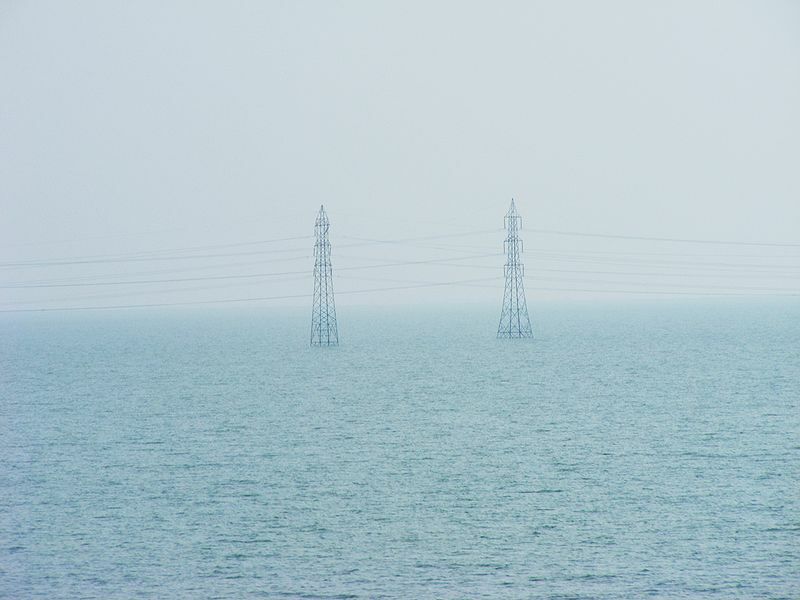 China power play: International conflicts include the potential upstream/downstream neighbor conflict, in which upstream projects could potentially alter or disrupt the flow of freshwater to downstream communities. In this case, China is usually the upstream neighbor, and India is the downstream party at the mercy of China’s political will. China largely acts on the premise that they may do as they please in their territory, though they occasionally make some attempt to acknowledge the potential downstream effects. The strategy used in most situations like this now is to pacify the potential conflict by stating that many of their projects are simply in planning stages (Tibeten Waters, a source of cooperation or Conflict?). The massive population and existing hostile relations between China and India play a major role in inhibiting cooperation because both countries have massive water needs, and they are under incompatible political regimes, making cooperation and collaboration exceedingly difficult. For Nepal hydropower holds the promise of immense wealth and political power, but this is tempered by dams that displace villages and cropland. One point of conflict lies between Nepal and the Indian border state of Bihar. It is here, where the Koshi River flows, that water rights issues come into play. Since 1954, when the Koshi Agreement was signed between Nepal and India to manage flooding, talks between the Indian and Nepalese governments have stalled and grievances have gone unaddressed. 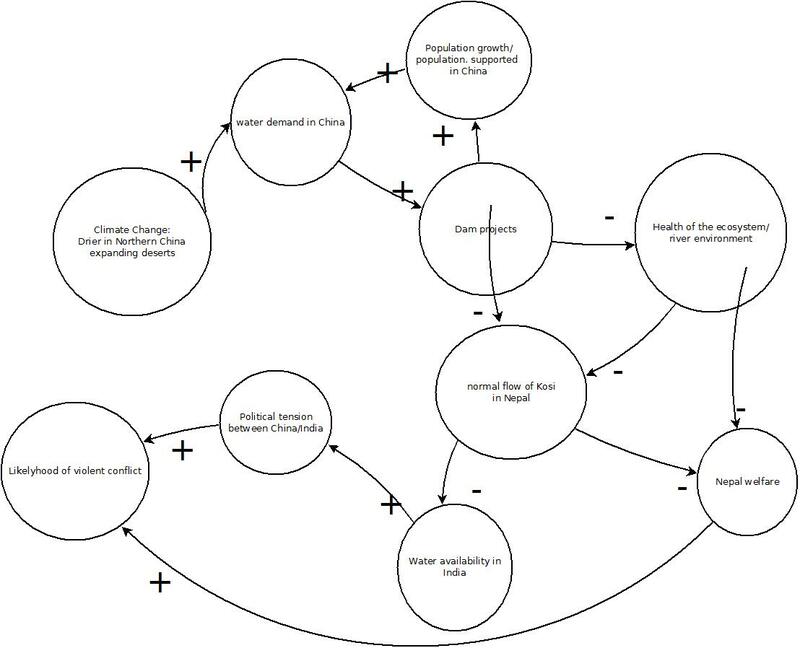 This causal loop diagram focuses on the impacts that climate change will have on an already tense political situation in which a shared resource is threatened by those who have territory at the source. Chinas bold actions and growth threaten the prosperity of its neighbors. Because all nations involved are experiencing growth and climate change will affect the whole region. A drying climate in the area will increase the demand for dams and water control measures, especially in China and Nepal. Some projects currently proposed in Nepal offer great hydropower potential, providing a method of generating national income and clean wwater, but these projectsthreaten the water rights of the Bihar region of India. The welfare of Nepal hinges on its access to clean water as well as access to the hydropower potential within its borders, and conflicts that stifle this access keep the chances low that many people in the country will be able to rise from abject poverty. This is somewhat in contrast to the rising powers that surround it. It is important to note that while this diagram demonstrates the likely paths to violent conflict and does consider factors that are actually influencing politics in the region, it does not necessarily mean that this outcome is certain. Regional. This conflict requires careful diplomatic relations between the three parties involved and transparency in the process will be critically important. There will likely be an increase in tensions between the involved nations. The likelyhood of small scale violent conflict is relatively high within the timeframe of now to 2050. If business continues as usual, China, a rapidly growing world power will likely dominate in the area and have its way in complete autonomy in controlling the water resources it desires. Jha, Hari B. "Tibetan Waters: A Source of Cooperation or Conflict?" Institute for Defense Studies and Analysis. N.p., 30 Sept. 2011. Web. The Times of India. ‘Overflowing rivers wash away Indo-Nepal Borderlines’ Article published 23 September, 2012.